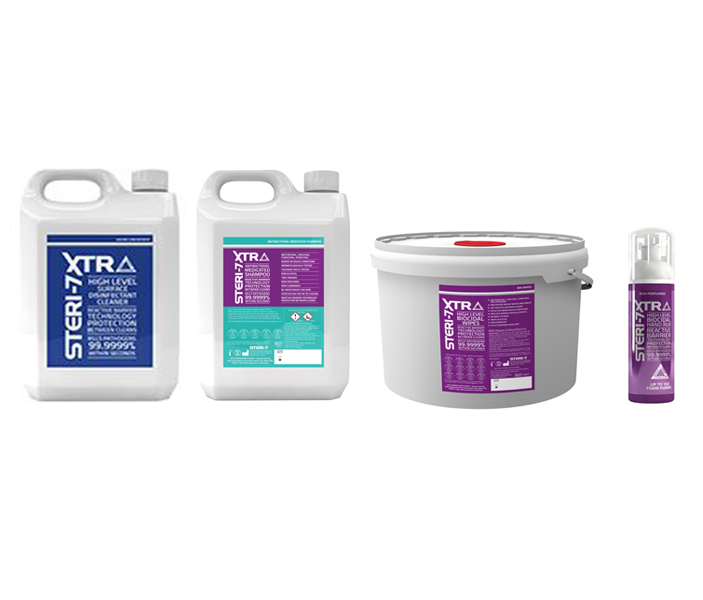 The Steri-7 Xtra Complete Bundle contains all you need to help protect your horse & stables from infectious disease. It contains Steri-7 Xtra Medicated Shampoo 5 litre; Steri-7 Xtra High Level Surface Disinfectant Cleaner 5 litre, Steri-7 Xtra 80 Wipes & Steri-7 Xtra Hand Rub 75ml. It's been proven to be effective for upto 14 days against key equine bacteria, viruses & fungi, such as ringworm; Equine herpes; Rhodococcus Equi; MRSA; Salmonella; Strangles & Aspergillus. When you buy the bundle, save over £15 compared to buying all the products individually. STERI-7 products offer proven protection in between cleans. They have a proven kill rate of upto 99.9999% of bacteria, viruses & fungi. They have even passed one of the toughest EU tests for disinfectant EN13697.